There is just too much going on around us nowadays that we often lose our perspective and get confused over what’s a priority or not. From a world that is rapidly modernizing where technology is closely tied to our everyday lives, the conflict of relationships and health woes make living extra difficult for some. The question not only boils down to coping but whether how prepared you are to face these changing times? Americans have witnessed their fair share of changes over the decades. And the most surprising of all these changes happened fairly recently when Donald Trump won the U.S. presidency. Not only is that he never had any political background but his very personality is something many do not think is a good fit as the leader of a great nation. The nation also has a lot to lose in many of the policies President Trump is pushing forward in Congress. The country is up in arms over how many people will lose healthcare under the Trump administration’s new healthcare plan. On Monday the Congressional Budget Office (CBO) published a report estimating that the number of uninsured Americans would increase by an additional 24 million people to total 52 million by 2026. (“In 2026, an estimated 52 million people would be uninsured, compared with 28 million who would lack insurance that year under current law,” the authors of the report write.) By next year at this time they estimate that number to jump by 14 million. This would reverse the current trend in the United States of reducing its number of uninsured inhabitants to the lowest rates in over 50 years. Under the Affordable Care Act (aka the “ACA” or “Obamacare”) the rate of uninsured Americans plunged from 15.7% in 2010 to 8.6% in September of 2016. The sectors that will be hit first and hard are the education, healthcare and the country’s economy among others. The new president is adamant to reverse “Obamacare” of the former administration and deny millions of Americans important basic services unable to access one when in need. Trump’s has a different means in mind in order for him to achieve his dream of Making America Great Again and he will proceed with his plans even at the expense of the people – the very ones who made it possible for him to secure his shot at the presidency. But another major concern to Americans is not just on the government’s capacity to provide basic health care services but in President Trump’s ability to perform his functions well. His family has a strong history of dementia and he himself acts strangely at times too. 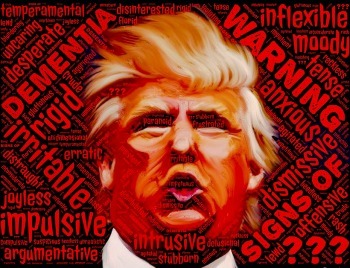 But, a consistent conversation among anti-Trump supporters continually points fingers to Trump’s mental stability as a reason for his unpresidential mannerisms, calling into question why psychiatric as well as medical information on the president have not been released to the public. The American people have reason to know the health, whether mental or physical, of those holding such a positions of power, but the diagnosis is wary. The American people got a lot on their plates right now but it is still too early to tell how the Trump leadership will turn out. With major changes expected to come their way, the only way the nation and the people can survive is when they stick together and do their part in realizing the dream of a better America and not just wish for it to happen.